Jays' Tee Vee: Princess Tutu: WHAT THE DUCKING DUCK! Princess Tutu: WHAT THE DUCKING DUCK! Prince Valium ... er ... Mytho and title character pair up for a duet. 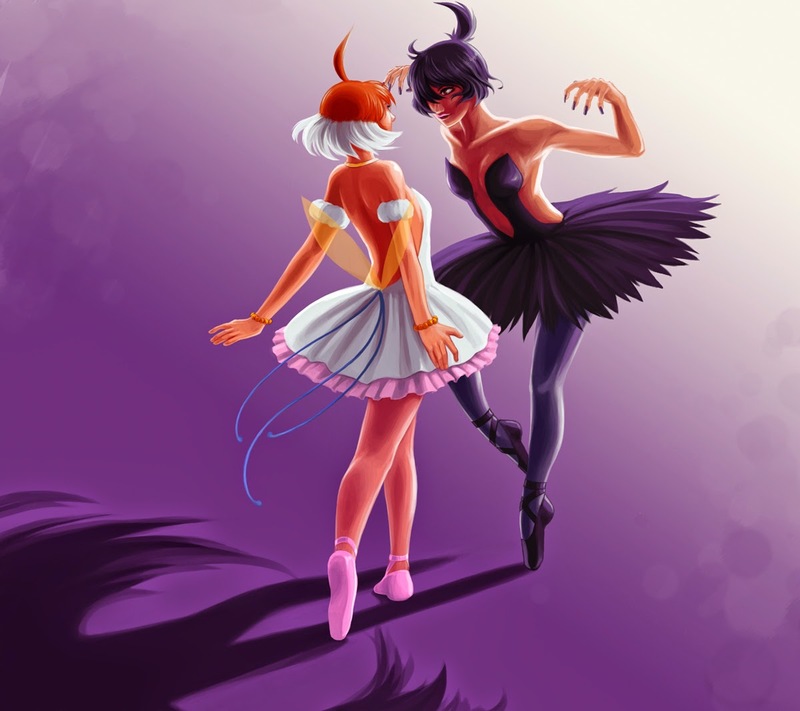 I truly enjoyed viewing Princess Tutu. After You Tubing the trailer and hearing Debussey, Korsakov and Wagner in it, well ... being a longtime fan of classical music, I resolved to watch it. After You Tubing a couple episodes, I fell across a copy at Half Price Books and snapped it up. What I originally thought to be a cutesy vomit inducing piece of drivel, I ended up enjoying. She's still a duck! 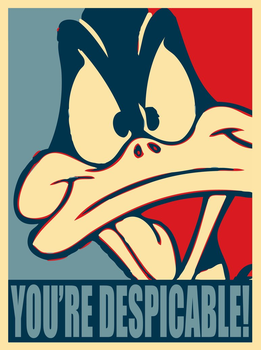 Still a duck! After all she did for every one she still ends up as when she started. A duck! Does she get the prince (Who sounds like the Hell Girl voiceover tryout runner-up.)? Not the original artwork. Tutu (left) and Kraehe square off. No! That darn Kraehe gets to keep him. Does she get to graduate? ! No! Not as a duck she ain't! Does she get to stay Princess Tutu? Does she at least get to stay human at the end? OH ... HECK ... NO! Oh sure, she ends up with Fakir but what good is that? He's a human and she's a duck and ... And I don't want any comments from any of you sickos out there about THAT! 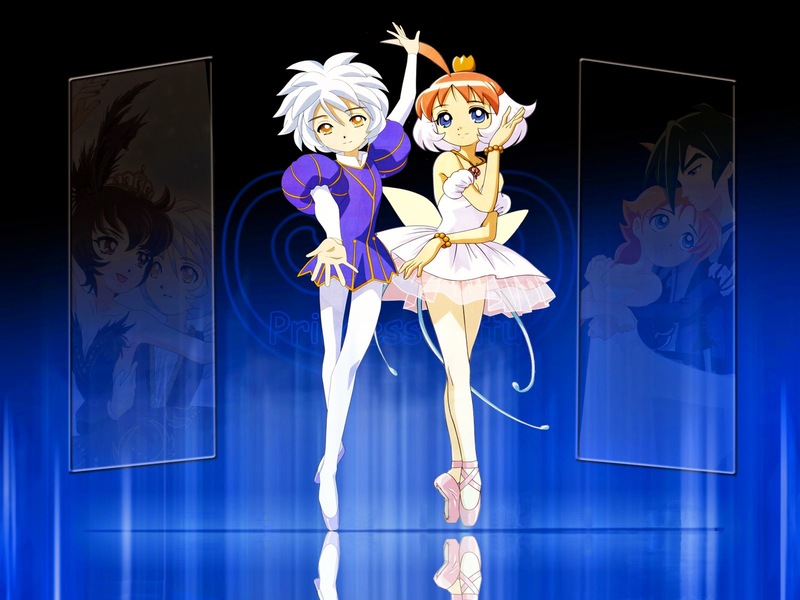 Wikipedia article on Princess Tutu here. Half Price books main web site here. Go to Jays' Tee Vee blog main page here. Ya see enny oder articles 'n pitchers here then yer already there! A Letter To Heaven: This REALLY Got to Me!